« Time to Make the Paper Donuts! 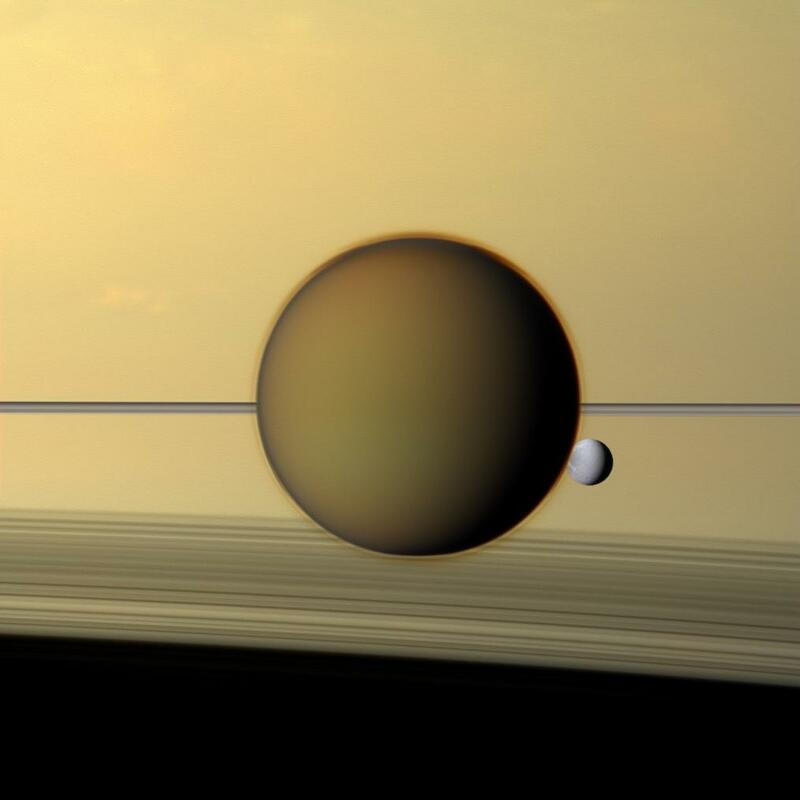 Astronomy Picture of the Day: Titan with Saturn in the background, in case you need reminding of how huge Saturn is. For those who aren’t interested in my personal life, feel free to skip the next paragraph and look over the links. As you know if you’ve been reading this blog for any length of time, I’ve been out of work since last summer. Though this blog has garnered a certain amount of attention, it’s still a very small operation; my work with Double X Science is a labor of love. However, I have just started a real paying part-time gig with Ars Technica! The hunt goes on, of course: I would need approximately 6 jobs like this before I would be earning as much as I was working full-time. However, it’s a great site and a good start down the road toward full employment again. We’ve all heard of Galileo, but how many of us have heard of Giovanni Battista Riccioli? (My spell-checker certainly hasn’t.) He was a contemporary of Galileo who systematically analyzed the Copernican model of the Solar System and concluded it couldn’t work: stars would be too big (which it turns out they are) and too far away (ditto), Earth’s rotation would be too fast, etc. As I’ve discussed many times on this blog before in other contexts, Riccioli wasn’t stupid, and his arguments made sense based on the data of the day. Christopher Graney argues that we need to teach examples like Riccioli’s to students to emphasize that science isn’t an act of sheer insight practiced by solitary geniuses, but a process. Scientists cite papers primarily in their own disciplines for a variety of reasons: we tend to focus on research in the direct area we study, and referees sometimes police submissions that cite apparently tangential material. However, scientists do read widely outside their own narrow fields and are influenced by what they read, largely to positive effect. Also from Double X Science, a new series: Good Deeds, Good Science! The first post went up Tuesday, about the highly educational BioBus. Let me/us know if you have an organization you’d like to see highlighted in a future entry. Congrats on the new gig! Even if it is a small job, it’s still very huge news! I believe the idea of self’ is a story or a work of art. I wish I could rmeember all the great things author Tom Robbins had to say along that vein. Also, how other individuals perceive me represents a character portrayal of my self in their own ongoing mythology. Undefinable portions of how we create the tale of our selves and the world around us become part of our art. For me, writing is like channeling. When I create a piece, I enter a sort of trance and I effuse some part of the stories both I, and those around me, create. Therefore, writing is like a blissful dissolution or dissemination of my mythical self, as well as flight through the amalgam of potentiality that we perceive as fixed reality. I hope my pieces live and breathe for as long as they can. As for me: I’m just a character and a medium. As such, neither I, nor my work can be anything but a transforming set of notions, who’s identity continually is born and dies. Thanks for the thought food.